The AFC Championship Game is the annual championship game of the American Football Conference (AFC) and one of the two semi-final playoff games of the National Football League (NFL), the largest professional American football league in the United States. The game is played on the penultimate Sunday in January by the two remaining playoff teams, following the AFC postseason's first two rounds. The AFC champion then advances to face the winner of the National Football Conference (NFC) Championship Game in the Super Bowl. The game was established as part of the 1970 merger between the NFL and the American Football League (AFL), with the merged league realigning into two conferences. Since 1984, each winner of the AFC Championship Game has also received the Lamar Hunt Trophy, named after the founder of both the AFL and the Kansas City Chiefs, Lamar Hunt. The first AFC Championship Game was played following the 1970 regular season after the merger between the NFL and the American Football League. The game is considered the successor to the former AFL Championship, and its game results are listed with that of its predecessor in the annual NFL Record and Fact Book. Since the pre-merger NFL consisted of six more teams than the AFL, a realignment was required as part of the merger to create two conferences with an equal number of teams: The NFL's Baltimore Colts, the Cleveland Browns, and the Pittsburgh Steelers joined the ten former AFL teams to form the AFC; while the remaining 13 pre-merger NFL clubs formed the NFC. Every AFC team except the Houston Texans has played in an AFC Championship Game at least once. The Seattle Seahawks, who have been members in both the AFC and the NFC, hold the distinction of appearing in both conference title games, a loss in the AFC conference title game to the Los Angeles Raiders for Super Bowl XVIII and, in their first appearance in a NFC conference title game, a win over the Carolina Panthers for Super Bowl XL. The Pittsburgh Steelers have the most appearances in the AFC Championship Game at 16, with 11 of those games being in Pittsburgh, the most for either conference. The New England Patriots have won the most AFC Championships at 11, and have played in a record eight straight AFC title games (2011–present). The redesigned Lamar Hunt Trophy, awarded since 2010-11 season. At the end of each regular season, a series of playoff games involving the top six teams in the AFC are conducted. In the current (since 2002–03 season) NFL playoff structure, this consists of the four division champions and two wild card teams (those clubs that possess the two best won-loss records after the regular season yet fail to win their division). The two teams remaining following the Wild Card round (first round) and the divisional round (second round) play in the AFC Championship game. Initially, the site of the game was determined on a rotating basis. Since the 1975–76 season, the site of the AFC Championship has been based on playoff seeding based on the regular season won-loss record, with the highest surviving seed hosting the game. A wild card team can only host the game if both participants are wild cards, in which case the fifth seed would host the sixth seed. Such an instance has never occurred in the NFL. Beginning with 1984–85 season, the winner of the AFC Championship Game has received the Lamar Hunt Trophy, named after the founder of the AFL. The original trophy consisted of a wooden base with a sculpted AFC logo in the front and a sculpture of various football players in the back. 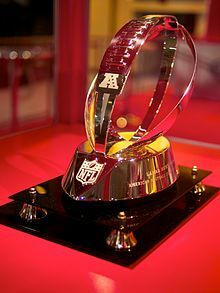 For the 2010–11 NFL playoffs, the Lamar Hunt Trophy and the George Halas Trophy, which is awarded to the NFC Champion, were redesigned by Tiffany & Co. at the request of the NFL, in an attempt to make both awards more significant. The trophies are now a new, silver design with the outline of a hollow football positioned on a small base to more closely resemble the Vince Lombardi Trophy, which is awarded to the winner of the Super Bowl. In recent years Conference championship rings are also awarded to members of the team who wins the AFC or NFC championship since they are the winners of the conference, even though they may not necessarily follow it up with a win in the Super Bowl. Numbers in parentheses in the table are AFC Championships. Bold indicates team won Super Bowl that year. Numbers in parentheses in the city and stadium column is the number of times that metropolitan area and stadium has hosted an AFC Championship, respectively. ^ b: The Seahawks were members of the NFC in 1976 and then members of the AFC from 1977 to 2001, before rejoining the NFC in 2002. Including their appearances in the NFC Championship Game (3–0), they hold a combined 3–1 record between both Conference Championship Games. ^ c: The Buccaneers were members of the AFC in 1976 before moving to the NFC in 1977. ^ d: Includes appearances during their first tenure in Oakland (the 1970 merger until 1981), where they went 2–5 in AFC Championship Games; their period as the Los Angeles Raiders (1982–1994), where they were 1–1 in AFC Championship Games; and their current tenure in Oakland (1995–present), where they have gone 1–1 in AFC Championship Games. ^ f: Includes appearances as the Houston Oilers (the 1970 merger to 1996), where they went 0–2 in AFC Championship Games. Since moving to Tennessee in 1997, they are 1–1 in AFC Championship Games. ^ Joe Robbie Stadium, now Sun Life Stadium, is located in Miami Gardens. However, the city was not incorporated until 2003. Prior to that, the area was an unincorporated area of Miami-Dade County, and the stadium used a Miami address. ^ The Miami Dolphins won 5 AFC Championships before losing their first championship game. The New England Patriots equaled that record before losing a championship game. ^ a b The franchise was founded in 2002. ^ The Jets last hosted the 1968 AFL Championship Game during the pre-Super Bowl era. ^ The Houston Oilers/Tennessee Titans franchise last hosted the 1962 AFL Championship Game. ^ The Jets won Super Bowl III as the 1968 AFL Champion. ^ "Playoff". NFL Record and Fact Book 2009. Time, Inc. Home Entertainment. ISBN 978-1-60320-809-3. ^ "First look at the Atlanta Falcons NFC Championship rings". 247sports.com. Retrieved February 5, 2019. ^ "Brandin Cooks thanks Patriots for AFC Championship ring". 247sports.com. Retrieved February 5, 2019. ^ "NFL passes new records in TV ratings". USA Today. 1 February 2011. Retrieved 11 October 2014. ^ "NFL Ratings Spike: 48.7 Million Watch AFC Title Game, NFC Game Draws 57.6 Mil". Deadline Hollywood. 23 January 2012. Retrieved 11 October 2014. ^ "AFC Championship Ratings". TV by the Numbers. Retrieved 11 October 2014. ^ "Astonishing Chart Shows How The NFL Dominates TV Ratings". Business Insider. 17 December 2013. Retrieved 11 October 2014. ^ Patten, Dominic (19 January 2015). "AFC Championship Game Ratings Stumble For CBS, 'Revenge' Rises". deadline.com. ^ Hipes, Patrick (25 January 2016). "AFC Title Game Ratings Score For CBS With 53.3 Million Viewers". deadline.com. ^ "NFL Conference Championships Overnight TV Ratings 2006-2016". sportstvratings.com. 23 January 2017.